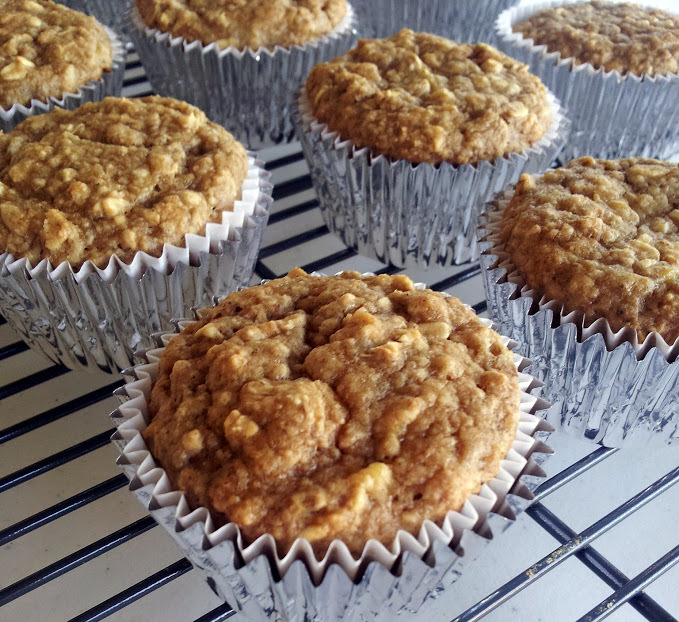 The kids love to get muffins in their lunch; and these are easy and much healthier than your average muffin – and the best part? They don’t seem to notice 😉 Thanks for reading, enjoy! Pre-heat oven to 400 degrees. Line a muffin pan with 12 liners or spray with non-stick spray. In a large bowl, combine oats with plain yogurt and milk. Meanwhile, mix together oat flour (see note above), baking soda, baking powder, sugar, spices and salt; set aside. Add applesauce, oil, egg and mashed bananas to the oat/milk mixture and stir well. Combine dry mixture with the wet mixture and stir until incorporated. Divide batter evenly into muffin tins and bake for 18-20 minutes. **Oat Flour: To make oat flour, simply pulse 2 cups old-fashioned oats in a food processor to create a fine meal. This should only take about 60 seconds!